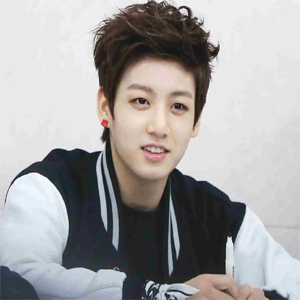 Full name: Jeon Jung Kook. Nicknames: JungKookie, Kookie, Golden Maknae. Profession: Singer, dancer, model and MC. Position: Main Vocalist, 3rd Principal Dancer, Rapper, and Maknae. Hobbies: Drawing, taking pictures of landscapes, dance, play games, read webtoons, comics, and exercise. Favorite color: Red, black and white. Favorite Weather: Sunny weather with a cool breeze. Jungkook has his own official page on FACEBOOK in which he accumulated 635K likes and he always uploads his videos and pictures on this page. JUNGKOOK has his own account on INSTAGRAM in which he has gained more than 842K followers. He always posted his Videos or Pictures on INSTAGRAM. To follow him visit this link which given above. JUNGKOOK has joined Twitter in June 2013. He has always posted his pictures and videos of his songs on his profile where he has gained 18.4K followers. The Link is given above. JUNGKOOK has a page on Vine. In this Page, you can see Vine videos of V. If you want to follow him visit this link which is given above. He has a page on GOOGLE+ in which he has accumulated more than 569 followers. To get updates you can visit this link which is given above. Comment below your views about Jungkook.